Tiger's in town and ticket demand is at an all-time high ahead of FedEx finale. Tiger Woods is not only back but he's in form and contending nearly every week he tees it up. That can only be good for golf and its interest levels! According to our friends at Vivid Seats, the average price for a single day pass to the Tour Championship from September 20 to 23 is $65 - and sales are up 170% on last year's season-ending tournament. 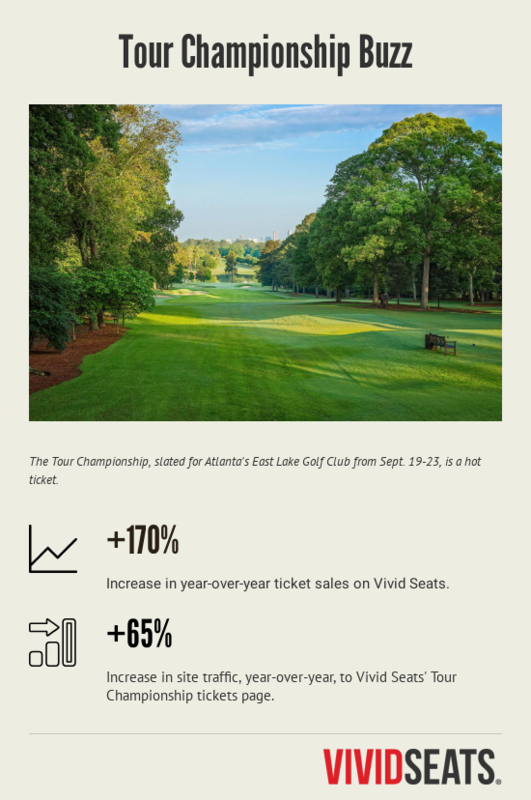 Additionally, traffic to the Tour Championship page on Vivid Seats has increased 65% since last year. Woods' close runner-up call behind Brooks Koepka at the US PGA sent CBS coverage into a frenzy. Check this spike in numbers out! The former world number one has qualified for the PGA Tour's FedEx Cup finale, qualifying in 20th position, but he will need to win the Tour Championship and hope for other results to go his way if he's to etch his name on a third FedEx Cup title. Woods won the FedEx Cup in 2007 and 2009, and he won the Tour Championship in 1999 by four strokes, and in 2007 by a whopping eight strokes. Fancy heading to East Lake? You can get your Tour Championship tickets here.